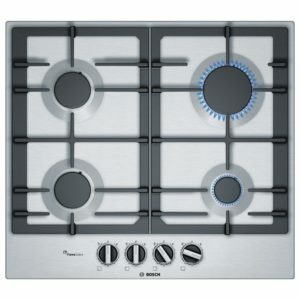 The ever popular gas hob is not only available in a simple, traditional designs but can also be the heart of a modern kitchen with the sleek ‘gas on glass’ design. 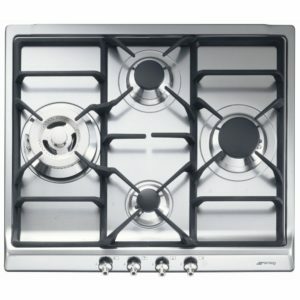 With the ability to control finely the flame size and therefore the heat, gas hobs are sought after in many households. Powerful wok burners and double flame options are also handy for the aspiring chef. With a huge array of sizes and styles available from the neat 3 burner to the grand 6 burner option and everything in between, the gas hob is a timeless look in any kitchen. 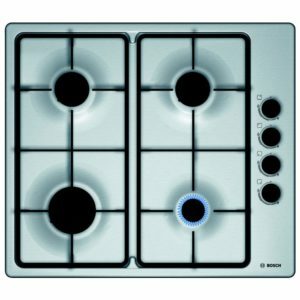 Powerful and precise cooking from four burners, this brilliant gas hob from Neff provides great cooking options so you can concentrate on cooking up your favourite foods. Neff's FlameSelect feature gives you complete control over your gas flame level. The flame adapts to any dish. Simply select one of 9 levels and you can see how the flame becomes larger or smaller depending on how you need it, just as easy as cooking on an electric hob! 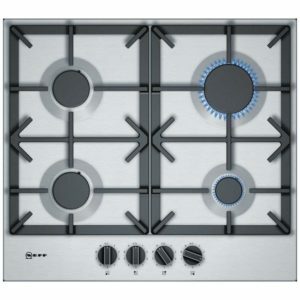 Finished in stainless steel the T26DS49N0 fits effortlessly in any modern kitchen. 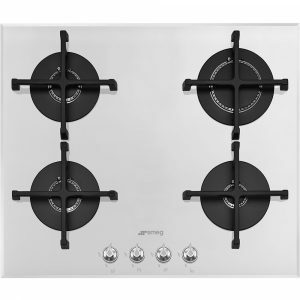 This superb 60cm wide gas hob from Smeg boasts four gas burners with cast iron pan supports. Finished in black glass it will look great in any kitchen. 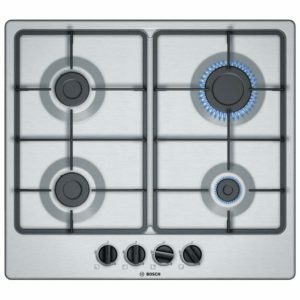 The Siemens EC6A5PB90 IQ-500 four burner gas hob offers front controls which gives you extra width for your pans. This model is finished in stainless steel and is supplied with durable cast iron pan supports. It is set up for use with natural gas but can also be used with LPG bottled gas using the alternative jets supplied. A flame failure safety device is fitted as standard for added safety. With a stylish black glass finish and low profile cast iron pan supports, this distinctive four burner gas hob from Neff looks fabulous. FlameSelect gives you complete control over your gas flame level. The flame adapts to any dish. 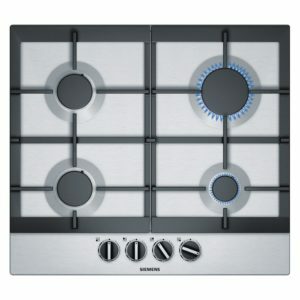 Simply select one of 9 levels and you can see how the flame becomes larger or smaller depending on how you need it, just as easy as cooking on an electric hob! With easy to use control dials and LED power display the T26CS49S0 from Neff is hassle free. 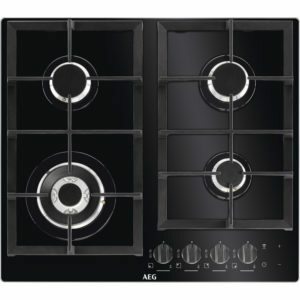 Beautifully styled, this sleek gas hob has sublime design, finished in black glass, with stainless steel trim and cast iron pan supports. Clever Flame Light indicators show clearly which control dial is in use at a glance, and for more autonomous control, this hob can be connected to an enabled AEG hood using Hob2Hood. 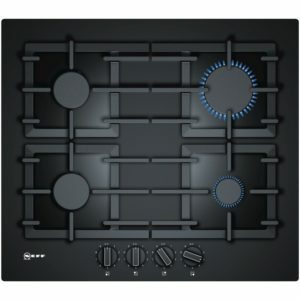 The hob and hood communicate, so the extraction will automatically adjust in response to increased power from the hob. Perfect if your hands are busy! 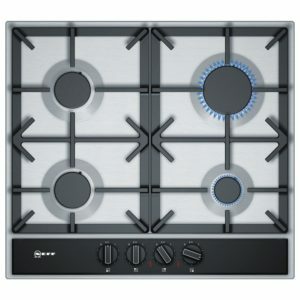 This superb four burner gas hob from Neff offers brilliant control of each cooking zone thanks to the Flame Select system, which utilises the fine control and rapid response of gas cooking. With its stainless steel finish and cast iron pan supports it has timeless design and looks fantastic in any kitchen. 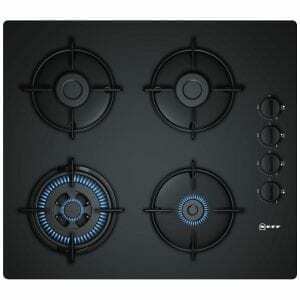 This superb 60cm wide gas hob from Smeg boasts four gas burners with cast iron pan supports. Finished in white glass it will look great in any kitchen. 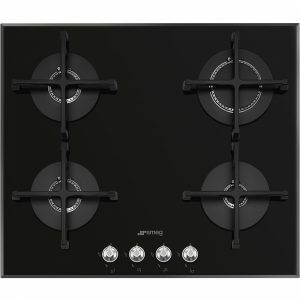 With its frameless black glass finish, designed for flush fitment, this four burner gas hob from Neff has plenty of appeal. Harnessing the fine control of gas cooking, the T26CR51S0 is easy to use with hassle free control dials.